Now that I live here, it may be time to do some local tourist attractions. I went to a live taping of The Voice a few weeks ago, but we weren’t allowed to take pictures. Or really talk about it, other than to say we did it. So. 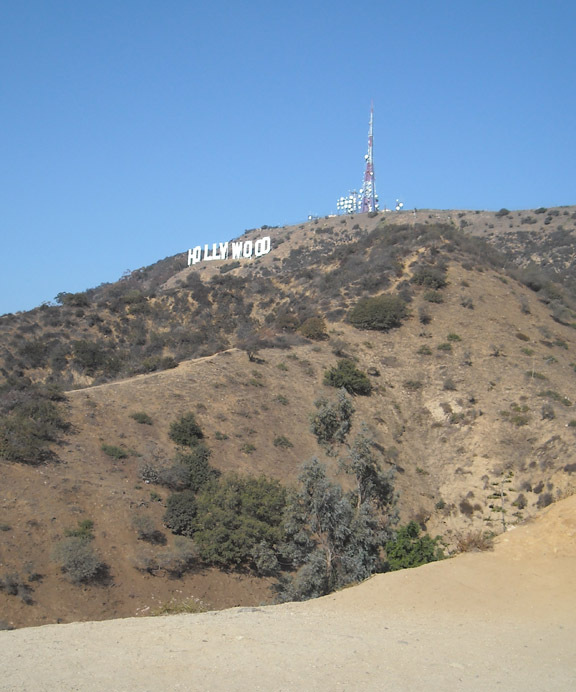 Today I’ll show you pictures of the big hike (I use the term loosely – more of a metaphor than an actual fact) up Mt Lee Drive to the tippy top of Hollywood. As hikes go, it’s a pretty easy climb. It’s a little less than two miles each way, most of it paved, and the steep uphill bits are interspersed with plateaus. The hardest parts were the stench of horsey poo and the flies that really wanted to lick our sweat. Blech. Tips to other explorers: make sure to bring water, sunglasses and sunscreen. You’re either in full shade or full sun all along the way, and I don’t know about you but I don’t need any extra problems when I’m trying to walk uphill. 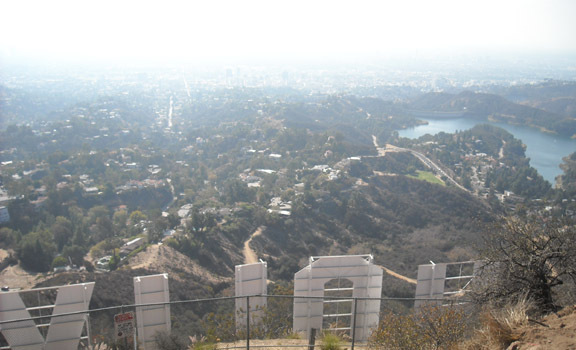 This is the closest we could get and still actually see the sign. So I took two shots for good measure. 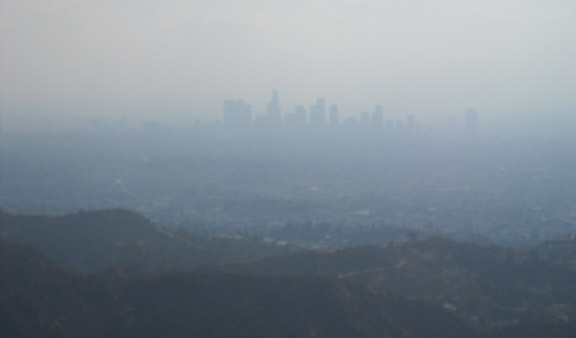 It took us about 40 minutes to climb to the top, and we saw several more tanned and svelte citizens beating us there and jogging back down well before we made it. But we didn’t give up. No sir. The quintessential tale of dream-chasing persistence. We made it! Got to see the world from up high. What a beautiful day, well spent. Did you do something new this weekend? Did you take a picture? Inspiration is like striking oil – except that you don’t strike it, it strikes you. So I guess you are more like oil, and inspiration is… wait. The point is, inspiration strikes unpredictably. In the same way that striking oil can be unpredictable. Right…? Well. You know what I mean. Particularly, I was looking at fonts. Which is a super fun thing to do. Dafont.com has a ton of free ones, and I came across several that I liked, but just as cool and whimsical as the fonts themselves were the font names. Mustache Gallery – for real. And I had just learned how to animate drawings in Motion, so the two ideas in combination created a powerful visual that must needs come to life. Resulting in the video below. Well, probably nothing. But it was really fun to make, I love it, and I hope you do too. I’m generally a happy person. I like sunshine and fresh air and music and friends. I literally stop to smell the roses. I wear pink. So how come when Barton Fink wakes up in the morning to find a dead body beside him, I thrill with fascinated curiosity? Why does Victor Maynard have a special place in my heart? And What is the appeal in any part of In Bruges? These are the questions that inhabit my thought bubbles. Dark Comedy is a genre that makes light of serious things – really serious things, like death. Typically the humor is extremely dry – so dry it might not be obvious that it’s supposed to be funny. The British are especially adept at this (Monty Python, anyone?). 1. Dark Comedy is a vicarious outlet. We all experience an occasional sense of hopelessness as regards our ability to control what happens to us. In a Dark Comedy, the hero gets to act on those feelings, take control in a very specific – and final – way. If I’m annoyed with my boss, I’m not going to plot his demise. But it’s fun to watch other people do it (and ultimately fail, as in Horrible Bosses… but that’s not really the point). 2. Dark humor is sarcastic, dry, and dreadfully smart. Something about the rhetoric-meets-diss just tickles my word-loving funny bones. Oh, the irony. 3. Dark Comedy sheds light on dark things. It takes the bad guy out of the shadows and puts him front and center – and no one can stand up to that kind of scrutiny without eventually belying their weakness. Villains are only intimidating because we don’t know much about them. They intentionally hide. But take the stuff of nightmares and follow them around their own problems – not so scary. Even Freddy Krueger has to pay rent and eat fiber. To repeat the wisdom of picture book author Taro Gomi, everyone poops. Everyone. Lastly, please watch the dark comedy short film I just produced during the LA 48 Hour Film Project. So what do YOU love about Dark Comedy? Don’t be scared. This is some really cool news on Vimeo, a leading motivator for independent filmmakers of all shapes. Take a look at VentureBeat’s article and see what you think – I am intrigued to follow this innovation and see where it leads! It’s not about what you know, it’s what you are. Screenwriter? Producer? Actor? Director? Film nerd? Movie addict? Wannabe? It’s a set of hats. We trade them back and forth depending on the situation. For instance, my Screenwriting Hat is my first love. Such a comfy hat, with so many possibilities attached to it. But there’s always that Producing Hat hanging around for special occasions. And lately, it’s been coming out of mothballs more regularly. You see, writers are not limited to merely writing. We can also help make the stuff we write. Authors do it all the time, with self-publishing and ebooks and marketing and blogs and all that stuff a writer does to get going in the literary world. Admittedly, making a motion picture is much more of a collaborative effort than publishing a book – though one might argue to the contrary. I will assert that video production and filmmaking are crafts specifically designed to function as a collaboration. It’s a team effort to interpret written words for a screen, whether it’s big and silver or small and iPod. So if this is your first foray into getting it made, where do you begin? If you’re working with more of the low- to no- budget scenario, this will require cake. As I expressed last week, a decent crew can often be induced to work for food. 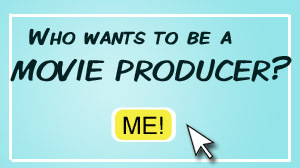 Because whether we are students, wannabes, or full-time professionals, we movie people are so fond of working. So if you are likeable and have an interesting story, you can accomplish a lot with good organization and decent snackage. Similarly, you will want to make sure you have the equipment you need in order to do your story justice. No lights? Shoot outside, on a cloudy day preferably. No sound gear? Congratulations, you are making a silent film. Don’t knock it, some very delightful films have been crafted with no sound at all (take the recent Academy Award winner for example, or my friend Peter’s gorgeous short, The Camera). Second, consider your strengths. Producers must be organized. Producers must persevere. Producers must be good communicators. If you are lacking any or all of these skills, I suggest you recruit a best friend, spouse, or significant other to help you. Once you start accumulating cast and crew members, setting dates, and making plans, the details will add up quickly – and that’s a lot of cake to keep track of. I also recommend sitting down with your director-slash-cameraman-slash-neighbor-with-an-iPhone to talk through your script. Estimate how much time it will take to shoot each scene. Generally, you will want to allow for a few run-throughs with your actors, as well as multiple angles. Make sure and communicate a basic schedule to your entire team, and differentiate who needs to be where at what time. Camera and lights people will need to arrive earlier than cast, since they will need time to set up. Of course a shoot will never go according to schedule, but you should start with one just the same. Third, stop considering and get to work! You will learn so much more by getting out there and making something than by reading and thinking and planning. Definitely read and think and plan, but don’t let that keep you from getting started. 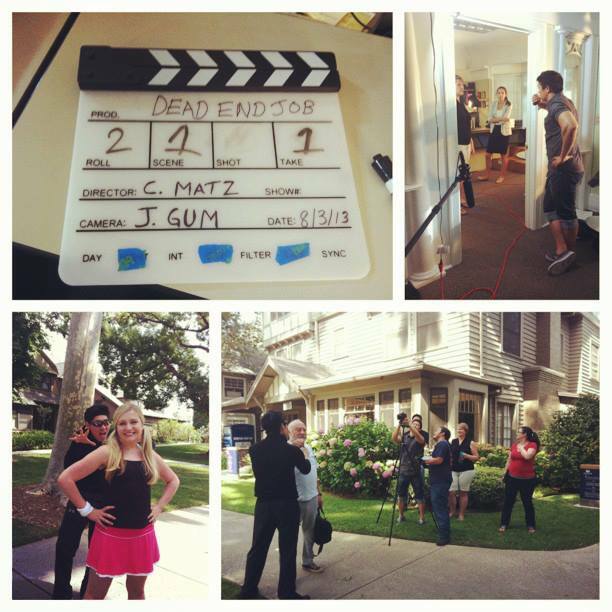 When I first started shooting my web series, I had been working for a production company for nine years. So I had a lot of the skills to get the show made, but I had also learned from hard experience that it’s nearly impossible to direct and run camera at the same time. There’s just too much to think about, and you’re sure to do one or both jobs poorly. I learned a lot that first shoot, but the stress of the weekend was made much more bearable with good planning, a cheery camera operator and on-camera talent, and this random guy on the right who wanted to take a picture with us. What are you working on? Let it come to life. I’m a screenwriter. I love movies and words and popcorn. But let’s say, just hypothetically, that producers have yet to bang down my door begging for screenplays. Do I just keep on writing and hope that someday those words will get moving? 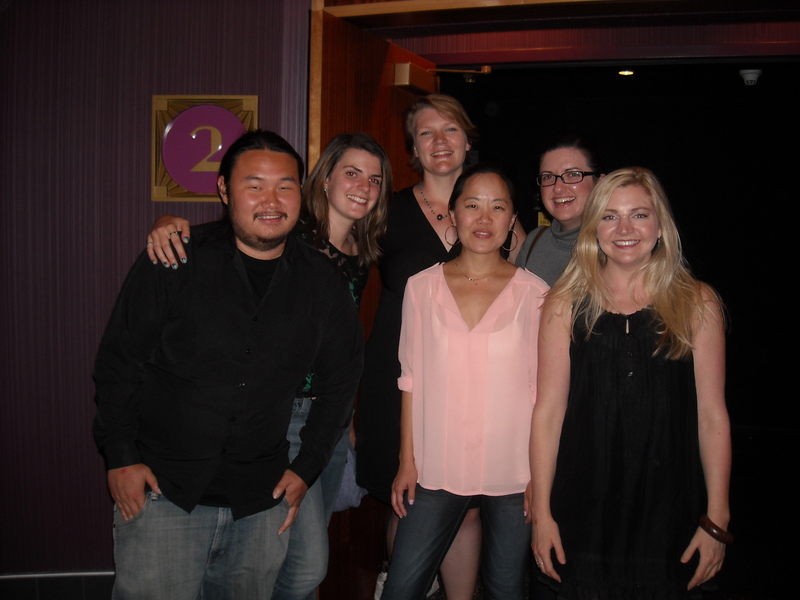 With my team at the screening of our 48 hour film, Dead End Job. Producing is no easy job, but if we’re eager to spin our ideas into a living, breathing experience, I say go for it. Short films and web series can be done in our spare time with a limited budget, and it gets us in the mode of making stuff. We are no longer dreamers and wishers. We are filmmakers. Filmmakers are allowed to say things like, “I have multiple projects in various stages of development,” which works even if you are still trying to corral friends and family members into helping you shoot your first video. Of course, filmmakers have a lot more responsibility than screenwriters. And chances are, there’s a reason we’ve been so focused on writing all this time… because writing is fun and producing might… not be? Or maybe we don’t know where to begin. If you happen to be best friends with award-winning actors and a hidden gem of a director, I would suggest you give them a call. If not, it’s still highly possible to put together a team of really good people who can help you tell your story. Asking friends for recommendations, posting in craigslist, contacting the communications department at your local university, can all generate leads for your budding production team. This approach always works for me, and it’s so much easier to work with a few folks who are pretty good at what they do, then to try and do everything yourself. It can be done, but why? If you could use a little kick in the pants to get started, go to http://www.48hourfilm.com/ and sign up for the project in your city. Between now and the start date, make it your goal to recruit as many people as you can for your team. Then you all get to write, shoot, and edit your entire 4-7 minute film in 2 days. And it will be finished, whether you like it or not. Take a look at the trailer for the Dark Comedy I just produced and co-wrote. Go get ’em. No budget, no script, and 48 hours. Can you manage a 4-7 minute film that isn’t terrible? This is the question I sought to answer over the weekend. 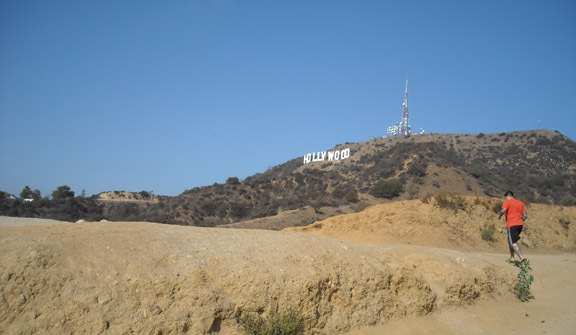 Being new to LA, and eager to dive into the local creative space, I gamely signed up for the 2013 Los Angeles 48-Hour Film Project. With no assurance that I would meet – let alone successfully entice – any quality filmmakers to come along and join me, I put on my Producer Hat (the one with the feathers) and went out on a limb. It was an experiment that definitely paid off. Maybe it’s the sleep deprivation talking, but I loved working with my team and I can’t wait to do it again. I went from zero to twelve in less than a month. Twelve talented, enthusiastic and dedicated people threw in their lot with this wide-eyed newcomer and made a short film. The tenets of the 48 Hour Film Project are that everyone has the capacity to make a film. The key is to just do it. So from Friday night to Sunday night, they give you a genre, a line of dialogue, a prop and a character – then send you off to get it done. And we got it done. Barely. First off, I had a mad week coordinating details with my team. 12 people is a wonderful number of helpers, but it’s also a lot of lives to revolve plans around. I was up to my eyeballs in email and to-do lists. It was awesome. Friday night came with much anticipation, and my co-writer, Sue, and I eagerly awaited our fates. First we drew a genre: Dark Comedy. Yippee! I love Dark Comedy. But wait – that’s because it’s really smart and ironic and brilliant. Can we do brilliant in 2 days? Maybe that’s why our official team name is The Brilliance. Oh yes. After some feverish brainstorming and a solid six hours of writing (in which we changed everything – twice) we had a script we felt pretty good about. We grabbed a few precious hours of sleep and at 6:30 I was up with the chickens to make breakfast for my production team. And yes, we had eggs. The next 24 hours were a whirl of excitement, intense effort, fun, juggling priorities, strokes of creative genius, disappointment, and hilarity. Everything you experience in the creative process, we experienced. Over and over again, on and on, for a solid day. Sustainable for a short time, but definitely not a lifestyle. Luckily we escaped with our lives AND our relationships intact. Despite Avid’s very best efforts to break us, our post-production team remained positive all through the weary night and late into our final day of editing, color correction, and sound design. Exporting files and burning discs in the car, we made it to the dropoff rendezvous just 10 minutes shy of the 7:30 pm deadline. Wiped out, but proud of the final product we delivered. To anyone considering a 48 endeavor, I highly recommend it. It is a phenomenal kickstart to your creative tendencies, and creates a defined goal around which you and your compatriots can rally. Plus you are together for two long days, which will either make you fast friends or mortal enemies depending on what kind of snacks you serve. 1. Next time, find a director so I can focus on writing and making food and encouraging my sweet team of expert guerrilla filmmakers. 2. I’m definitely a producing writer. I love producing, but I wouldn’t want to produce just anything – the most fun for me is nurturing a story from beginning to end. This is really a helpful eureka moment, because I keep second-guessing that feathered hat. 3. I’d rather have a dedicated, professional, and enthusiastic team than all the time in the world. Most of all, I garnered an even deeper respect for all the professional creators who steward hundreds and thousands and millions of dollars to create something worth watching. This stuff takes guts, you guys. Creating is an adventure. Don’t sit back and wait to see if someone’s work will be good – get up and help them make it good. Pioneer that territory, blaze that trail. Give your critical tendencies a vacation and just go play. It may not be brilliant, but it will be worthwhile. Promise.